Upholstery cleaning is a technical task, which as any other type of professional cleaning, requires specialist approach and sufficient prior experience. Professional upholstery cleaning is the best and most effective way to bring back the brightness and freshness of all your non-leather furniture such as sofas, couches, armchairs, padded stools and even some mattresses. Attempting to clean such delicate fabric finishes using conventional cleaning and washing methods will not yield the best possible results and is likely to cause damage such as color fading, permanent creasing, tearing and breaking so instead of risking all that, just let us handle your upholstery cleaning requirements quickly and efficiently with no risk to your delicate fabrics and materials. People say upholstered furniture doesn’t require that much cleaning since it doesn’t see the same amount of use like the carpet for instance, but this isn’t quite right. Upholstered furniture is used on a daily basis just like the carpet, the same amount of dust and pollen is spread all over the furniture as it is on the carpet, more so – the upholstery is in daily contact with your body so dead skin cells, skin oils along with all the other household pollutants such as kitchen odors can really make the upholstery feel nasty and in need of some serious cleaning. Our upholstery technicians are trained to asses and determine the state and the damage the fabric has sustained before they decide upon the best way to clean it depending on the type of material and the level of soiling or staining. Our upholstery cleaning process will not cause damage to any other parts of the upholstered piece and will not leave any toxic residue or bad smells lingering in the room after the cleaning is done. We can perform the upholstery cleaning on all types of furniture, our equipment is of professional grade and suitable for furniture pieces both big and small. If you want to bring back the vibrant colors of your upholstered furniture to their former glory and do so without spending a small fortune then we are just what you need. Upholstered furniture is quite demanding and complicated to keep clean as upholstery in most cases is made of sensitive fabrics and materials which require specialist approach and a professional touch. Our professional upholstery cleaning service is the best and most effective way to keep your non leather furniture such as sofas, couches, armchairs, padded stools and mattresses looking great and feeling fresh. In most cases, conventional cleaning attempts performed on these delicate upholstery fabrics and materials will end up causing more damage than good so in order to avoid color fading, permanent creasing, tearing and breaking just use a professional cleaning service and save yourself the hassles and costs of having to reupholster. Some people don’t see the need for upholstery cleaning as the furniture doesn’t get the same amount of heavy duty use like the carpets do but in truth, upholstered furniture receives the same amount of dust, pollen and bacteria as any other piece of fabric in the room. One other reason to have the upholstery cleaned regularly is its constant contact with the human body. The furniture upholstery receives a large daily dose of dead skin cells, hairs and body oils, these along with stubborn kitchen and pet smells can really leave the upholstery in need of some serious cleaning. If you want to have your upholstered furniture fresh, clean and ready to use in a matter of hours by all means let us handle the chore for you, quickly and efficiently, with minimum fuss. Our upholstery technicians are trained to asses and determine the state and the damage the fabric has sustained before they decide upon the best way to clean it depending on the type of material and the level of soiling or staining. The cleaning process leaves no trace or damage on any other parts of the furniture piece. The cleaning materials used by our technicians are bio degradable and non-toxic, they will leave no residue in the fabric or the room. The cleaning equipment we use allows us to perform effectively on all types and sizes of upholstered furniture. Furniture upholstery sees some heavy use on a daily basis. The furniture upholstery receives the same amount of dust, pollen and dirt as the rest of the house does and it doesn’t take long for it to show the need of proper cleaning. There are different types of upholstery found throughout the home, each type requires a different cleaning approach in order to yield the best possible results without risk of damage to texture or color. Professional upholstery cleaning is the only proven and effective way to care for your non leather furniture such as sofas, couches, armchairs, padded stools and mattresses. Attempts to conventionally clean and wash upholstery will likely result in fabric damage such as fading, structure altering, discoloration or creasing so save yourself the woes of having to reupholster and let us handle the upholstery cleaning for you quickly, efficiently and with no fuss. Upholstered furniture is also in constant contact with the human body which in turn leaves body oils, odors and dead skin cells on the upholstery and overtime these can make the furniture piece feel and look tatty or worn, which is another reason for you to consider professional upholstery cleaning as no other method will remove these effectively. Customers can be sure their delicate upholstery fabrics are in good hands and will be treated accordingly. 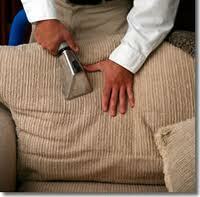 Our cleaning technicians are trained to determine and asses the level of soiling sustained by the upholstery. They will then administer the most effective and sparing way to clean the upholstery and bring back its colours and original appeal. The upholstery cleaning methods we use will not damage or have an effect on any other parts of the furniture piece but the upholstery. Our cleaning technicians will be able to perform exceptionally well on all jobs big or small, the equipment we use allows us to carry out efficient cleaning of even the smallest of upholsteries. If you appreciate the good looks and clean feel of your fabric-finish furniture – we guarantee to have your upholsteries bright and clean in a matter of hours.